Gaia, the billion star surveyor. This is the mission slogan. A billion stars. One thousand million stars… That is a lot. Really a lot of stars. If the final catalogue with just the summary of all data accumulated by Gaia were printed and all volumes were nicely aligned in my bookshelf, the row of 53,542 volumes would extend 1.3 km (and this would only be the summary data of all non-special stars). So, I hope you appreciate the point that a billion stars is really a lot. This is also what one of the space enthusiasts that visited the open day of the European Space Research and Technology Centre (ESTEC) a few weeks ago must have thought when he asked me this question after the Gaia lecture I delivered: “A billion stars, but there are by far not enough astronomers to study these all…” And, for sure, he was right. Gaia will measure the distances, motions, brightness, and colours of a billion stars but they will not be scrutinised one by one. The power of the billion stars is that they form a representative sample of the entire population of our home Galaxy, the Milky Way, which is inhabited by about 200 billion stars, give or take 100 billion. And such a representative sample allows astronomers to perform statistical studies where individual stars are of no importance but only the masses count. In this way, particular patterns and structures (correlations in scientific jargon) can be revealed which will lead to new insight in the structure, dynamics, and history of the Milky Way. So, for most astronomers, the vast majority of the one billion stars in Gaia’s catalogue will remain anonymous entries in an online database. There are, nonetheless, interesting stories to individual stars and the Gaia data will undoubtedly prove to be a resource for numerous best-sellers. Take, for example, the star Zeta (z) Ophiuchi (Zeta Oph for short). Zeta Oph is one of the brightest stars in the sky and can be seen with the naked eye in the constellation Ophiuchus. 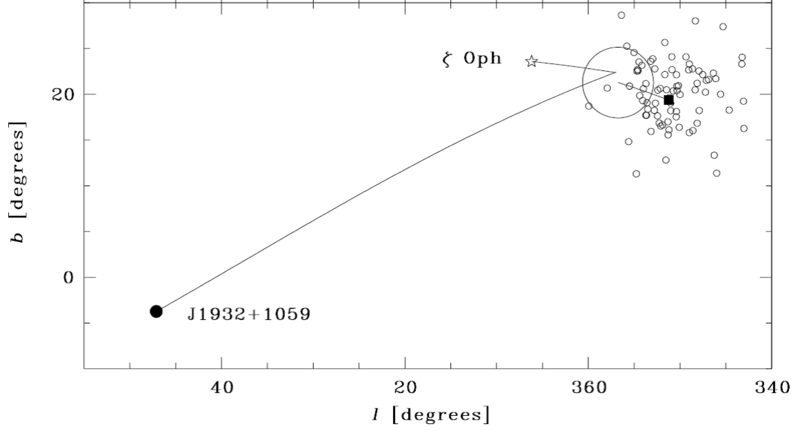 The distance of the star is around 366 light-years, with an uncertainty of about 8 light-years (Gaia should reduce this error to a fraction of a light-year). It is 20 times more massive than the Sun, which makes it a very rare star. Such massive stars burn their fuel – hydrogen – at very aggressive rates and the lifetimes of such stars are hence limited to less than 10 million years (in comparison, a star like our Sun is very energy efficient and, despite having 20 times less fuel than a star like Zeta Oph, can live for 10,000 million years). 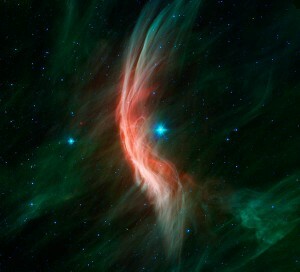 But the two most striking features of Zeta Oph are its high velocity and its isolation in space. To explain this, let’s make a historical digression to 1914. 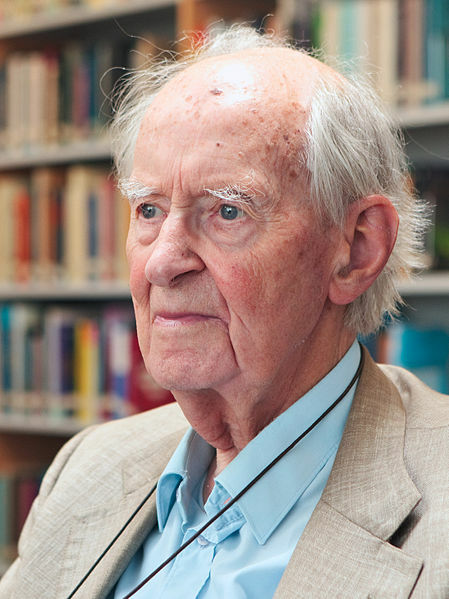 That year saw the birth of Adriaan Blaauw (1914-2010), who became one of the icons of Dutch 20th century astronomy. Blaauw studied astronomy at Leiden University, under De Sitter, Hertzsprung, and Oort, and obtained his doctorate with Van Rhijn at the Kapteyn Laboratory in Groningen in 1946, with a thesis entitled “A study of the Scorpio–Centaurus cluster” (a copy of which I was lucky enough to find in a second-hand bookshop in Leiden 15 years ago). Scorpio (nowadays called Scorpius) and Centaurus are two constellations, visible from the southern skies and adjacent to the constellation Ophiuchus, which contain large numbers of bright, massive stars, much like Zeta Oph, clustered in groups. During his career, Blaauw extensively studied these groups (called OB associations, after the types of stars they contain) and he is generally considered to be the father of this research area, together with Armenian astronomer Viktor Ambartsumian. As it happens, during my PhD studies in the late 1990s at Leiden Observatory, I also studied OB associations, but using the newly-released data from Gaia’s predecessor satellite, Hipparcos. This satellite provided the distances and motions of 117,955 stars within a few hundred light years of the Sun, but with precisions that were orders of magnitude better than Blaauw had at his disposal in the 1940s. Not surprisingly, Blaauw, in the late 1990s in his early eighties but still remarkably fit, had a keen interest to closely follow what I, and my colleague Ronnie Hoogerwerf who was also doing a PhD on the same topic, were discovering about “his associations”. Blaauw frequently visited us in Leiden and we would then spend a day or two intensively discussing our progress, looking at plots we had produced, and brainstorming about what all these data, that Blaauw had been waiting so long for, were trying to tell us. The key motivation to study OB associations is the argument that, since the stars they contain are massive and hence short-lived, these groups must be young, i.e., recently formed. Therefore, their study offers direct views into the formation process of stars, where many mysteries still remain unresolved. One striking fact, already obvious from just looking at the skies in Scorpius and Centaurus, is that (massive) stars form in groups, and not in isolation. The isolated location of Zeta Oph, far away from any other massive stars, was hence a mystery. This mystery was further enhanced by the presence of the Scorpio-Centaurus (Sco-Cen for short) OB association 120 hundred light-years away and the fact that Zeta Oph is moving away from this group with a velocity of 30 km per second. So, indications were strong that Zeta Oph and Sco-Cen are genetically connected. But what then made Zeta Oph run away from its parent birth group? 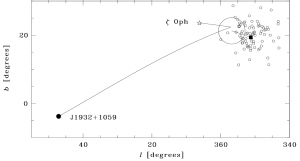 Blaauw put forward a novel and elegant hypothesis (“the proto-binary hypothesis”) to explain this mystery in 1961 in one of his most famous works entitled “On the origin of the O- and B-type stars with high velocities (the ‘run-away’ stars), and some related problems”. He proposed that Zeta Oph was born in the Sco-Cen association in a so-called double (binary) star composed of two massive, short-lived stars. The stars in this system were circling each other, under the influence of their mutual gravity, with velocities of some tens of km per second. The most massive star in the binary reached the end of its life within a few million years, after which it exploded in a supernova explosion, just leaving a rapidly rotating neutron star (pulsar) escaping the scene with a velocity of a few hundred km per second as a result of the kick it received in the explosion. The surviving component, Zeta Oph, suddenly ceased to feel the gravitational pull which kept it in its orbit and hence flew away at its orbital velocity, some 30 km per second. This hypothesis was generally accepted in the years to come but not proven until 2001, when Hoogerwerf and myself, in collaboration with our thesis supervisor, Tim de Zeeuw, identified the pulsar and traced the orbits of Sco-Cen, Zeta Oph, and the pulsar back in time over one million years in three dimensions to find that they were all at the same place at the same time. Not surprisingly, this finding pleased Blaauw enormously. And I am convinced that he would be equally thrilled by the revelation of many more similarly exciting stories that the Gaia data will tell us about the stars! This article was written by Jos de Bruijne, ESA Gaia Deputy Project Scientist. Thank you for sharing your story, Jos! Very interesting post, Jos. I’ve heard that the same “runaway” hypothesis may apply to Betelgeuse. Gaia should settle that case too one way or another.